If you have been intrigued and curious about the Knights Templar and their history, then visiting the city of Tomar is a must. Tomar is a charming and naturally beautiful town in central Portugal. It is also popularly known as the Knights Templar City as it was once the seat of the Order of the Knights Templar. First, let me give you a brief history of Tomar. Tomar was founded by D. Gualdim Pais (the most famous master of the Order of the Temple) in 1160. He is also responsible for initiating the construction of what is today known as the Castle and Convent of the Knights Templar, a land which was gifted to him by King Afonso Henriques as an appreciation for his service in the battle of Ourique. The Templar Castle then became the seat of the Order of the Temple until 1314 when the Pope ordered the disbandment of that religious order. It was however transformed to the Order of Christ by the Portuguese King D. Dinis from 1357. Where is Tomar in Portugal? Tomar is 140 kilometres (87 miles) northeast of Lisbon located on the banks of the Nabão River in the central Portugal region. Tomar is well-served by both road and rail transportation. 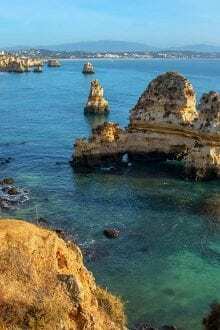 The drive to Tomar from Lisbon takes approximately one and a half hours via the A1 motorway (this route has many tolls). Alternatively, you can drive to Tomar via the A1 and IC9. Click here for driving route options. The train to Tomar from Lisbon can be boarded from either Santa Apolónia or Oriente train stations in Lisbon. The journey to Tomar takes a little over two hours. 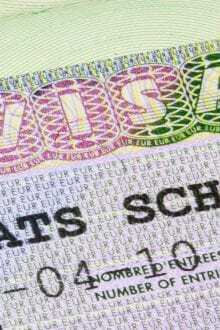 Tickets can be purchased at the station and sometimes it is possible to buy the tickets online. See Comboios de Portugal for train schedules and prices. In Lisbon to get a bus going to Tomar, you should go to the Sete Rios Bus Terminal. Sete Rios can be reached via the Metro (subway) on the Blue (“Azul”) line. You should stop at Jardim Zoologico and then follow the signs to the bus terminal. You can buy the tickets and check the bus schedule at Rede Expressos. The trip takes approximately one hour and 45 minutes. Getting around Tomar is very easy as most of the monuments and attractions are close to each other, so, it is easy to explore the city by foot. But if you would like to go further out of Tomar, it is best you get a rental car because public transportation is not the best especially if you would like to visit the river beaches (“fluvials”). There is no shortage of things to do and see in Tomar. Tomar is littered with so many beautiful and historic monuments. If there is something you must see in Tomar, it is the Convent of Christ, a UNESCO World Heritage Site, which comprises of both a castle and a convent. In the convent you will see the 12th century Oratory of the Templars as well as the window of the chapter-house which has a grandiose design. In general, you will be marvelled at the intricate way Manueline, Gothic and Renaissance architectural styles were used to design this effusive monument. Tickets are normally €6 but if you are a resident in Portugal, you can get in for free on Sundays and public holidays up until 2pm. There are also discounts for sudents and seniors. For more information, see the website here (in Portuguese). Convent of Christ, Tomar, Portugal. Believe it or not, this 6 km (4 mile) masterpiece was designed to transport water from the village of Pegões on the outskirts of Tomar to the Convent of Christ in Tomar. 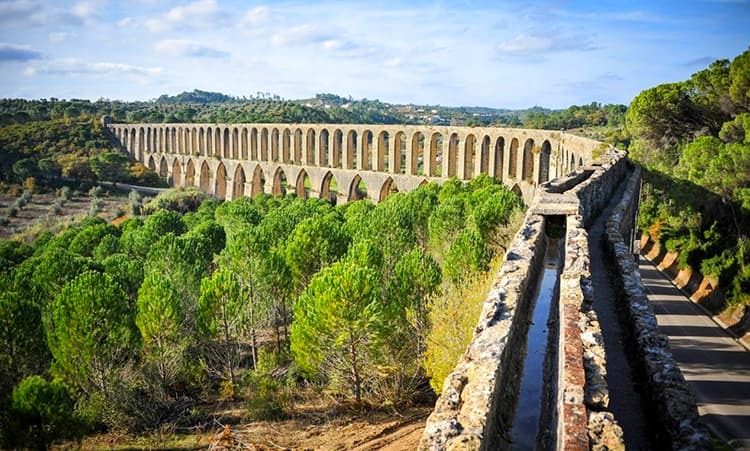 It is worth seeing the Pegões Aquaduct in Tomar. You can walk on the Pegões Aquaduct near Tomar, Portugal. This is also a national monument in Portugal and one of the very few Coeval Jewish temples in Portugal. The Tomar Synagogue was built in the 15th century by the Jews that lived in the town at that time, but was eventually closed in 1496 when the Portuguese Jews were expelled from the country. After which, it was turned to Prison and later a warehouse and a storage room. It was restored in 1939 and is home to the Abraham Zacuto Luso-Hebrew Museum with a large collection of artefacts describing Jewish customs. For more about the synagogue, have a look at their website. The Forest of Sete Montes is an incredibly beautiful park that I am sure you will fall in love with. It is also known as the bush of the Convent of Christ. 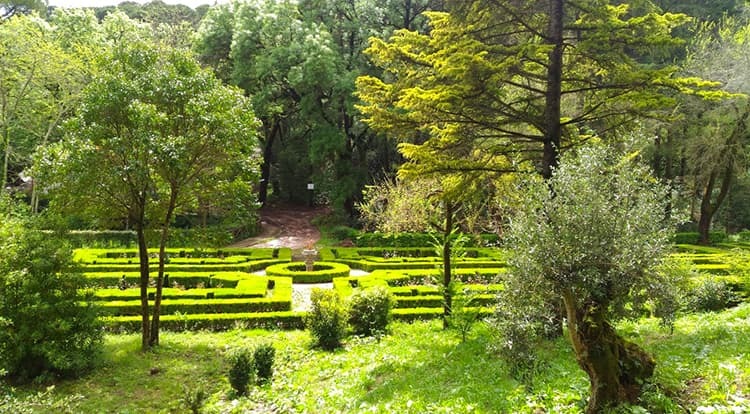 The Forest of Sete Montes is a pleasant space for hiking or walking as there are many charming gardens and fountains in the park as well as the Romanesque Charolinha. 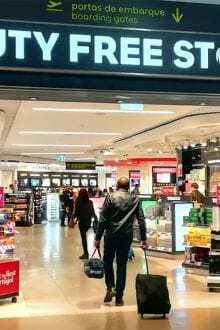 It is a short walk from the city centre so you don’t need a car. Take a stroll in the Forest of Seven Hills, Tomar, Portugal. This is another interesting place to visit in Tomar. Museu dos Fospóros is a fascinating museum with a collection of matches, matchboxes and matchbooks from all over the world presented in a very beautiful way. It is near the railway station and a short walk from the historic centre of Tomar. The lovely Mouchão Park is a pleasant place to chill and relax or walk after a long day of sightseeing. You will also get beautiful views of the river and the waterfalls from the park. It’s quiet and romantic especially at sunset. The Republic Square is the main square in Tomar. At the centre of the square is the statue of Gualdim Pais, the founder of Tomar. 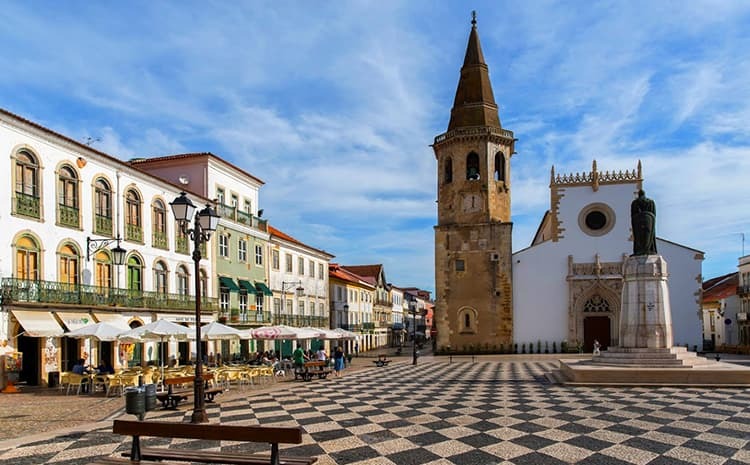 The square is surrounded by beautiful houses, one of which is the Igreja de São João Baptista, a 15th century Catholic church. There’s often events and things going on at the main Republic Square in Tomar, Portugal. This is a gem situated on a tiny island in the middle of the Tagus River. 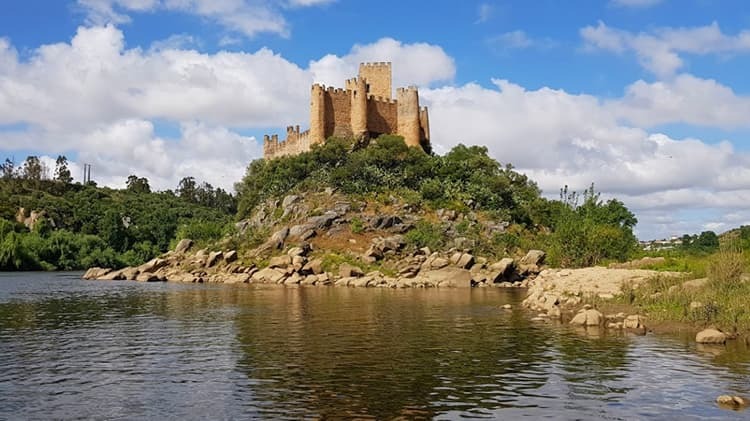 Almourol Castle is a very historical castle especially in the Christian reconquest in Portugal. The surrounding areas and landscape of the castle offers great scenery and the views from the summit of the castle are priceless. To reach the castle, it’s a 30-minute drive from Tomar. Once you get there, take a 5-minute boat ride from the shore. Note that during the lunch break there are no boats running so you can relax on the shore, go canoeing or have something to eat at the nearby café. Nearby Almoural Castle is worth a visit. If you happen to visit Tomar at the end of June, you should join in The Festival of the Trays that will take place from 29 June to 8 July, 2019. It is usually very ecstatic and gleeful. This event happens once every four years. 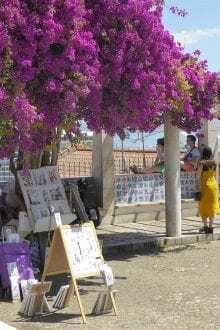 For more information, check out Visit Portugal’s website on this festival. The weather in Tomar is generally mild throughout the year although it gets a bit cold during the winter. The hottest months are usually between August to September and the average annual temperature is 16°C (62°F). If you would visit Tomar, the best time to visit is between April to October. The weather is usually warm with less likelihood of rain in these months. Eating some local dishes in Tomar should be on your to-do list when you visit Tomar. There are a bunch of family-run restaurants which offer great regional dishes. Taverna Antiqua is a medieval-themed restaurant with an excellent ambience that offers a variety of local treats. You can even purchase the clay goblets that your beer or wine came in as a souvenir. O Tabuleiro (website is in Portuguese) is a family run restaurant in Tomar which also has typical Portuguese dishes which are tasty and very pocket-friendly. Calça Perra (website is in Portuguese) is a nice garden restaurant with excellent dishes. It can be a bit pricey though. This is another place to try authentic regional dishes in Tomar, great wines and Fado music is Casa Matreno & Casa das Ratas. The prices are very pocket-friendly too. Do not forget to try the sweet traditional pastries like Slices of Tomar (“Fatais de Tomar”) and Kiss Me Quickly (“Beija-me Depressa”) which you can get at the local pastry shops and bakeries (“pastelarias”). If you like this article so far, be sure to subscribe to our newsletter for more like this every week. If you decide to spend a night or two in Tomar you can be rest assured, you will find decent accommodation. All the hotels above are in the city centre which makes any of them a good base to explore the city from. Usually, you can see everything in Tomar in one day. 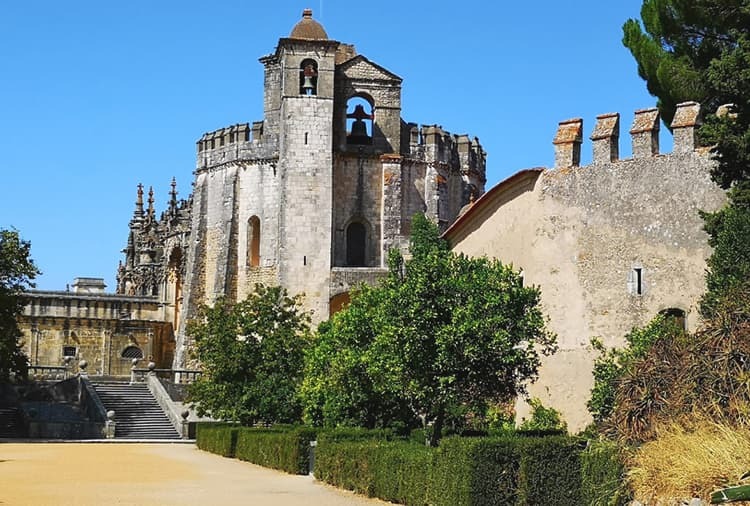 It is common for travellers to visit Tomar as a day trip from Lisbon or as part of a tour of central region of Portugal when visiting places like Fatima, Batalha, Alcobaça and Coimbra. Generally, I would say visiting Tomar helps you to learn more about Portuguese history. If you would like to visit Tomar with a group or as a private tour you can check out Get Your Guide for group tour packages. Go on a quest for the Knights Templar legacy in the Tomar region. Marvel at the Convento de Cristo, one of Portugal’s most unique and impressive architectural monuments, listed as a UNESCO World Heritage site. To book this tour early, click here. Is Tomar a nice place to live? Tomar is a peaceful medium sized city with a population of a little over 40,000 people. 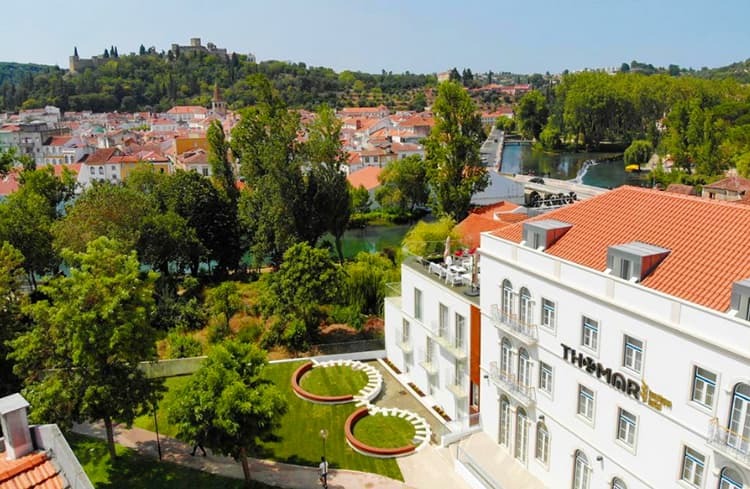 As a place to live, Tomar is a good choice if you are looking to stay in a less bustling city in Portugal. 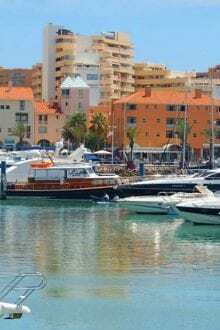 It is an ideal city to live in for many expats who choose to retire in Portugal and want to enjoy an authentic Portuguese lifestyle. Also, the property prices in Tomar are generally much lower than the average prices in Lisbon and Porto. So, start planning your trip to Tomar, the famous Knights Templar city in Portugal. Tomar is waiting for you! Did you have any questions about Tomar, Portugal? Just ask us below. I’m an freelance writer, who’s very passionate about economics and everything that is related to business. Currently doing a study semester abroad, in Italy, I’m pursuing a Masters Degree in Management in Portugal, where I live. I love photography, traveling and experiencing new cultures.